Ever walked by a retail store only to be puzzled by what the name of the song they were playing over the speakers? The MusicMarker device helps you out in this aspect, as you record a sound snippet with it, bring it home and hook it up to a computer via USB. It will then perform some diagnostics and identify the track for you thanks to the infinite knowledge pool known as the Internet. 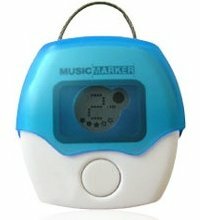 The MusicMarker retails for $19.95. Nice. I woudn’t pay 20 bucks for it though… But I am not really into music. Would be awesome if someone got that feature into some of the micro-mp3 players w/ a mike out there. Or you could get get the new G1 and install Shazam. Does it all over wifi, no going home to hook it up to your pc.